In my last post, I discussed some facets of our M4 platform, so I thought it would be interesting to take a look at the red team workhorse, the AK Family of weapons. Like our M16/M4 Series, the Russian’s have been busy modernizing and trying to stay current over the years. Without a doubt, the AK and varients outnumber any other weapon system in the world, including ours. For that reason if no other, it deserves a solid look at what brought it to the level of success it has seen in the world, and we will look at where that platform is moving in the future. I personally believe everyone should be familiar with the AK platform because it is the most encountered weapon we face in opposition, and dismissing it as an effective weapon system could be a lethal mistake. When most of us think of the AK, all sorts of images stir. 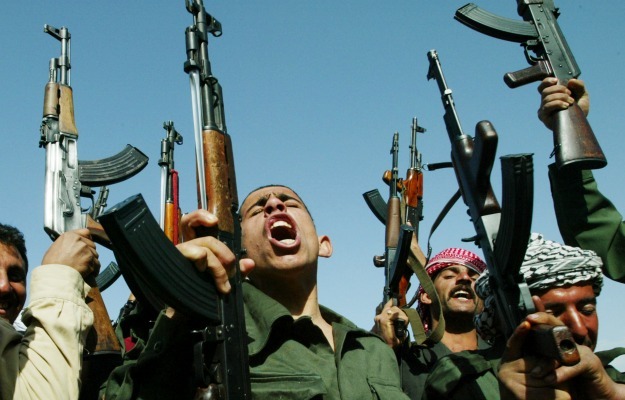 Typically we think of rag-tag groups of rebels or insurgents with dirty AK’s in everyones hand. That is due in part that the weapon is reliable under the harshest of conditions, and was cheaply built utilizing stamped receivers instead of more robust milled receivers. The low cost, simplicity, and the desire of the Soviet Union to expand it’s influence, made it an extremely prolific weapon leading up to and during the Cold War period. The Soviets were pumping them out as fast as they could and practically giving them away in arms deals to developing nations, and with the inherent instability in many regions following the Soviet collapse, large stockpiles fell into the hands of anyone who wanted them, and they flooded into the black-market arming entire populations. The weapon was adopted and standardized in 1947 by the Soviet Union. It was designed by Mikhail Kalashnikov after WW II. Mikhail was exposed to the first real assault rifle, the Nazi Sturmgewehr 44, as well as the American M1 Garand. Both weapons appealed to him, and he set about making a hybrid of those designs competing to become the new Soviet firearm utilizing the newly produced M43 7.62x39mm cartridge. 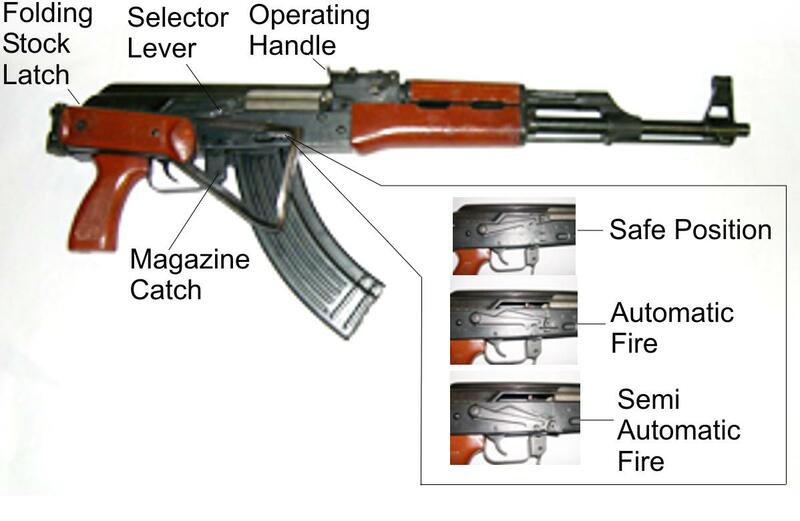 Compared with most auto-loading rifles, the AK-47 is compact, of comparable range, moderate power, and capable of selective fire. The AK is simple, inexpensive to manufacture and easy to clean and maintain. Its ruggedness and reliability are legendary. The large gas piston, generous clearances between moving parts, and tapered cartridge case design allow the gun to endure large amounts of foreign matter and fouling without failing to cycle. This reliability comes at the cost of accuracy, as the looser tolerances do not allow the precision and consistency that are required of more accurate firearms. Accuracy is further reduced by the pistol-like sight apertures and short sight radius. Reflecting Soviet infantry doctrine of its time, the rifle is meant to be part of massed infantry fire, not long range engagements. While the AK family is rugged and affordable, it is not modular like our M16/M4 platform. The Russians have a very limited equivalent to the US SOPMOD Program, and thus, the AK is extremely limited in use of multiple devices past the main optic such as lasers or lights. Typically, if an optic is mounted, it is done using a bolt-on side mount adding a rail over the rear sight. The Russians have natively produced some scopes and optics similar to our own such as 4 power scopes, red dot optics, and it appears they have begun purchasing EOTech Holographic Weapon Sights as evidenced in this video below, a compilation of footage of the ongoing Russian conflict battling Muslim Extremists in Dagestan. Even still, these optics are expensive, heavy (often over a pound alone), and formerly were reserved for special units such as Spetznaz GRU. Interestingly, and not widely known to civilians is that the AK-47 has been available in the US Special Operations arsenal since 1981. Technically, it is the Chinese Norinco Type-56, a copy of the AKM-47 and AKMS-47. The reason it is available to US Special Operations is for realistic opposing force training, for familiarization training, and for presence deniability in select operations. It’s hard to say American Forces aren’t present when the baddies find 5.56mm brass all over the scene. Additionally, in some environments, 7.62x39mm is more available and the AK doesn’t give up a disguise like strolling through the hillside with M4’s would. As you can see in the above image, the weapon is very simple to break down. You unlatch the dust cover, press and unhook the drive spring, pull back the bolt carrier while lifting out, rotate the bolt to remove, and finally, unlatch and lift off the gas cylinder tube. That’s it, in 5 simple steps. This ease of take-down for cleaning and maintenance makes it attractive, there are no small parts to lose, just large component pieces near anyone can understand. Actually operating the weapon effectively is more of a challenge due to some ergonomics challenges in the now 60 year old weapon system. As you can see above, the charging handle is on the right-hand side of the weapon. I recommend shooters learn to use the left hand to manipulate the bolt so that the weapon can be brought up to eye level (the ‘workspace‘) such as for reloads. Speaking of reloads, notice where the magazine catch is? To reload, bring the weapon magazine into your sight plain (workspace), then the catch must be toggled to drop the magazine, and then the new magazine is hooked on the forward edge of the magazine well before rocking back and locking into place. Once locked in, reach over or under with the left hand and cycle the charging handle. Lastly of concern is the safety selector switch. Unlike the M4 where you can quickly sweep to fire with your thumb, here you use your right pointer finger to sweep from safe (top) to auto (middle) or semi (bottom) position. It takes practice to get used to. A word of caution, if the dust cover is removed to clear malfunctions and the weapon is loaded, rotating the selector switch upward beyond ‘safe’ WILL cause a round to be discharged. Obviously that can be dangerous to the unaware. AKM-47 – Modified AK-47, Stamped Reciever, modified gas cylinder, muzzle compensator added. Most Common. AK-74 – Replacement for the AK-47. Changed to 5.45x39mm. Upgraded gas system. Polymer furniture. AKS-74U – Equivalent of our CQBR in size, short barreled (8.3″) AKS-74 employed like a sub-machine gun. AK-74M/AK-105 – Improved AKS-74, with side mount and compensator. AK-105 has short barrel, flash hider. AK-101/102 – Chambered in 5.56x45mm. Same features as AK-74M/105. AK-103/104 – Chambered in 7.62x39mm. Same features as AK-101/102. AK-107/108 – Chambered in 5.45×39/5.56x45mm. Like AK-74M/105, with a recoil balance system. The biggest change that surprised the world was the production of 5.56mm rifles. If you went back to the Cold War period and told any General they would produce rifles chambered in that caliber, you would be laughed at heartily. No one saw that change coming at that time but it shows the willingness to stay competitive for arms contracts with NATO members, many of whom employ AK derivatives. Another big change has been the announcement of the AK-12. This new iteration is very modernized, and many note, westernized as well featuring a monolithic top rail like our M4, quad-rails in front, ergonomic grip and ambidextrous controls (Charging handle, safety). On ammunition, we don’t see a whole lot of development like we have here stateside, at least with the original 7.62x39mm. The 123-grain M43 round had already been researched during WW II as an intermediate cartridge by the Soviet Union. The original round was very stable in flight, and caused through-and-through injuries frequently as it would not begin to tumble until typically penetrating 10″. If a round penetrates completely through the target, its full energy is not transferred and wounds are much less severe typically. The problem was addressed with the introduction of the newer M67 round. The new round had its center of gravity more rearward in the bullet, causing the far more lethal yaw tumbling effects in wounds desired to incapacitate faster. The newer round still does not tend to fragment and the tumbling path of the round inflicts the majority of tissue damage but is shown to cause two large temporary and permanent wound cavities much like the effect in the newer 5.45mm seen below. With the production of the AK-74 rifle, the Russians chose a lighter round, the 49-grain 5.45x39mm for much the same reasons that drove the US to adopt 5.56x45mm over 7.62x51mm. The lighter cartridge would reduce weight while enhancing firepower by troops carrying more ammunition. In this cartridge, Russia has had ongoing development much like the 5.56mm has. In the original 5N7 bullet, it acted very much like the older round it replaced in wound profiles as seen above with more immediate yaw on entry of soft targets. The new caliber has less mass and produces less muzzle velocity (2,900ft/sec) than the 5.56mm fired from an M16 Series, but equals that produced by the M4 with its 14.5″ barrel when compared to the 16″ barrel of the AK-74M. 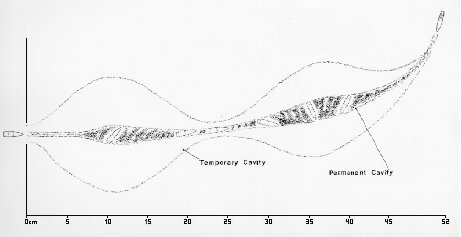 Later, with body armor becoming more common, the bullet was modified several times to improve armor penetration by incorporating a steel rod penetrator. The current issue round, the 7N10 uses a 27-grain steel penetrator and has increased fragmentation effects and is identified by a violet band on the tip. 7N22 bullets are further enhanced for armor piercing and have a black tip with red band. Unlike NATO ammo however, their tracers are identified by green tips. To wrap this article up, I urge all soldiers be familiar with the basics of the AK series at a minimum so you can safely handle live weapons and aid site exploitation efforts. As prevalent as the weapon is in the world, it will likely remain common in 50 years to come, and likely still work despite being antiques. I personally don’t like the platform or its ergonomics, but I know it works and I respect its capabilities, as should you. Interestingly, this is the first year Russia will not purchase any new rifles, they finally say they’ve got enough stockpiled! I believe they may mean legacy AK’s, perhaps they intend to focus on the AK-12 as part of their modernization efforts? As I like to say, time will tell.